My kayak trip the preceding night was so special that I was almost tempted not to go out again, but a fallen tree had kept me from making it all the way to the Atlantic Ocean. I knew I might not have the chance to make it over there again before the deadline for my museum exhibition, When I arrived at Dubois Park, this fisherman I met looked at me as if I was a little dense and asked if I knew where the sun was going to rise. I politely explained that I was aware it was going to come up behind me, but that the clouds and lighthouse were pretty spectacular and I wanted to photograph them first. In fact, at approximately 150 years old, the lighthouse is very special and the oldest building in South Florida. Fortunately I was on a narrow spit of land and turned around and saw this. The water ,seemed to flow through pretty quickly here, and I assumed it was cleaner because of its proximity to the ocean. The portion of the Loxahatchee I kayaked the evening before was designated a Wild and Scenic Waterway in 1985 and the entire river is part of the Everglades Comprehensive Restoration Plan. Issues affecting this river are flow, and of course pollution from human waste and runoff. The Loxahatchee River District provides monthly data on bacteria, nitrogen, phosphorus and chlorophyl. I ran from the inlet to the ocean just in time for sunrise and saw all these fisherman lined up. There were birds fishing in the waves as well and pelicans kept flying overhead. Man and nature were coexisting in a healthy balance. It felt great to be there at that moment, though I couldn't help but remember how many sustenance living people I had seen fishing in polluted waters while doing this project. It costs a lot of money to live in this area, so the people fishing in these cleaner waters could easily have afforded to purchase fish instead and wereout here fishing this early for sport as well as food. There was so much activity, man and creatures alike enjoying the abundance nature still has to offer. Fishable, swimmable, drinkable water is such a worthy goal and should be a right for every being inhabiting this planet. The fish I saw people pulling out looked healthy and of good size, unlike the fish in the Everglades which have been tainted with mercury and other toxins and is unsafe for the Miccosukee to eat. The injustice can be traced back to the Battle of the Loxahatchee, which was fought along this River in 1838 and effectively ended the Second Seminole Indian War forcing the Seminoles to surrender. From Jupiter Pointe, I headed to Jonathan Dickinson State Park named after, a Quaker whose ship ran aground five miles north and whose party was spared by the Jega Indians and driven on a harrowing march to St. Augustine. The State Park, though 11,500 acres is only part of the 240-square-mile watershed that drains into this river. With sea level rise, this river will be in trouble, if it has to depend only on the freshwater within its boundaries. Dredging projects in the 1960s and 1970s pushed too much saltwater upstream, and the issue was compounded by canals that diverted the natural headwaters. To help alleviate the stress on the river, a gated structure was built to divert the flow from one of the canals. However, this measure is not sufficient and the continued health and viability of the river depends on land acquisitions. Riverbend Park was opened in 2007 after extensive restoration, and a large portion of the Pal-Mar area has been purchased to protect the Western Watershed. In addition, Cypress Creek and its wetlands are being acquired, and the 16,000-acre Atlantic Ridge on the Northwest has been earmarked for purchase. Cypress Creek had been carrying lots of sediment from agricultural drainage, so making this public land will not only help protect the flow it will benefit water quality as well. The area near the boat ramp was primarily mangroves, but as a paddled towards Trapper John's Cabin, I was amazed by the diversity along the river. In fact, Jonathan Dickinson State Park supports 147 plant families, with 130 flowering varieties, almost as many as the Everglades 152 plant families, yet JDSP is 11,500 acres compared with the Everglades' 1.5 million acres. Bald Cypress, cabbage palms, laurel oaks, red maples, and pond apples are just some of the trees found here. There are many birds along the river too, including woodpeckers, wood storks, wood ducks, swallow tailed kites, and ospreys. This osprey nest at the bend in the river was most impressive. 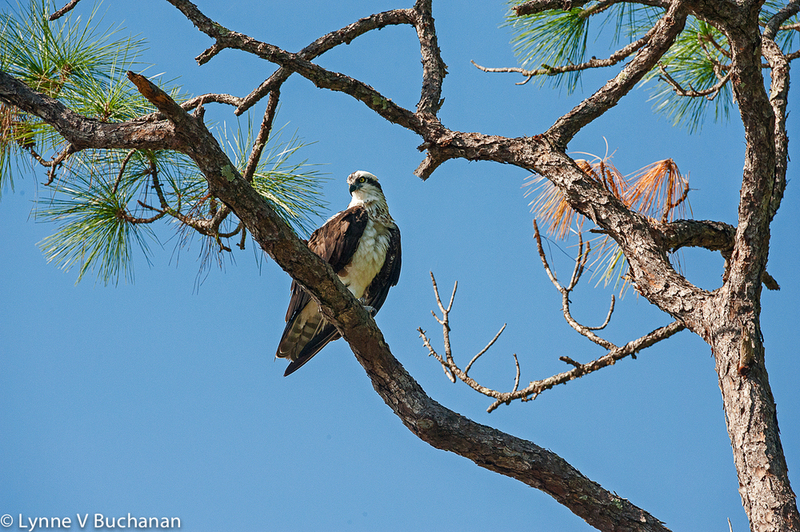 Below are several photographs of ospreys and a heron I saw while I was paddling. While I was kayaking, I saw smoothed out patches of water that are the sign of manatees. I stopped paddling and drifted and soon realized I was in the center of a group of five or six manatees. It was so incredible to float there with them, watching them surface and come close to the boat. Manatees are such peaceful creatures and I love being in their presence, but I worry a little when they are too curious of boats, even though mine had no motor, since so many are harmed or even killed by boat traffic. I made it down to Trapper John's wilderness camp, which consisted of this dock, a timbered cabin and a chickee hut. He is considered Jupiter's own Tarzan and when I saw photos of him, I could understand why. He apparently always walked around in only shorts and boots and had quite an impressive physique. He soon drew tourists and was a trapper a third of the time, a showman a third of the time, and a property acquirer. In forty years, he purchased over 1,100 acres of riverfront property, 856 acres of which was annexed to the park after his mysterious death in 1968. The image above was close to Trapper John's cabin and seeing this and other beautiful vistas made me understand why Trapper John was happy to live in this pristine area where he could live off the land in harmony. Let's work to preserve the continued health of this special river's ecosystems and all the life it supports.